Mary J Blige felt the love without the haters as she performed her first UK show in four years. The Grammy-winning singer pulled off an energetic and enthusiastic set at London's Roundhouse as part of the iTunes Festival, jumping around and showing some impressive dance moves in spite of her vertiginous heels. To cries of "Go Mary" and chants of "Mary! 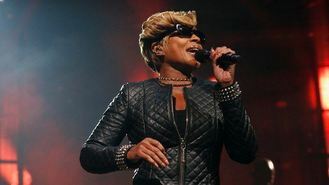 ", the 43-year-old songstress - wearing a black leather jacket, crop top and tight trousers - sang older hits such as Just Fine, Real Love, Happy, One and Be Without You as well as tracks from her upcoming 13th album, Mary J Blige: The London Sessions. "I love you, London. I thank you so much over the years. You have helped me grow," she told the screaming crowd. "That was the history of Mary J Blige that we just went through," she said after the first 30 minutes. "Not all of it. Just some of it. We are now going to the evolution of Mary J Blige. We had some help from your man Sam Smith, Emeli Sande and your boys Disclosure." Mary introduced new songs Therapy, co-written by Brit winner Sam, along with Right Now and F For You - her collaborations with Disclosure. "You ready to take this journey with me? Keep it real," she said before performing No More Drama. The iTunes gig, which was streamed live online as part of the month-long festival, was a preview of her first UK tour in four years in November, accompanying the album's release on November 20. Overwhelmed by the applause, an emotional Mary admitted: "You have no idea how much this means to me right now. Thank you so much," before ending her set with a performance of Family Affair. Kylie Minogue, Ed Sheeran and Lenny Kravitz will perform in coming days, before Placido Domingo closes the festival on September 30. Katherine Jenkins has gushed about having a "special day" amid reports she is marrying her fiance tonight. Radiohead frontman Thom Yorke has released a surprise new album, bypassing record labels and download stores to sell it directly to fans. Samuel L Jackson showed off his vocal skills as he hosted a celebrity-packed karaoke night to launch a new charity single. Lady Gaga has shocked fans after she asked for her coat back when they fought over it during a concert. Lorde has been named the hottest music star under 21 by Billboard. Pharrell Williams has struggled to contain his emotion as he met a couple who played his song Happy at their son's funeral. Ben Howard left fans wanting more, after his performance at the 2014 iTunes Festival. Kylie Minogue has showed off her saucy side as she kicked off the European leg of her Kiss Me Once tour in the UK. Ed Sheeran has revealed how writing hit songs for One Direction got him in trouble with his record label.